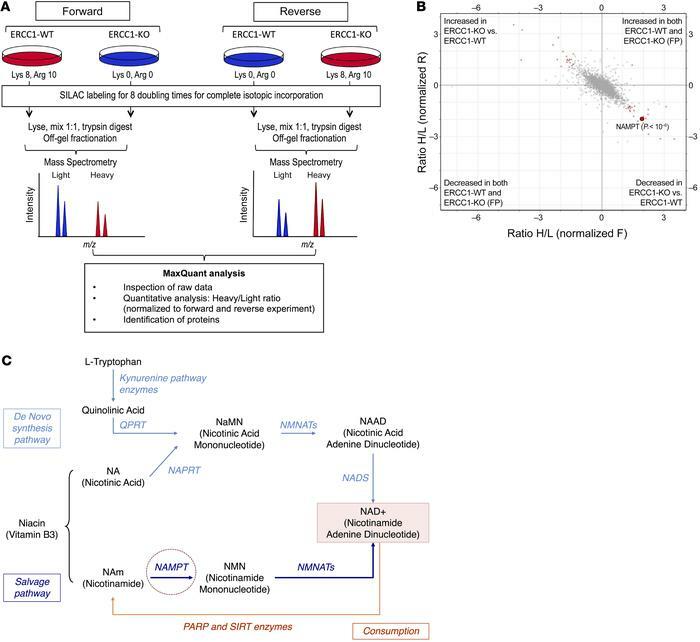 SILAC-based proteomic analysis identifies NAMPT decrease as a potentially targetable node in ERCC1-deficient clones. (A) Experimental workflow for quantitative proteomic analysis using SILAC. Two independent experiments in the ERCC1-WT and ERCC1-KO cell lines from the A549 model with inverted labeling of the cell lines (forward and reverse experiments) were set up and run in parallel in order to limit the number of false-positive hits by having an internal control (n = 2 independent samples for each model). Protein lysates were mixed in a 1:1 proportion between the heavy- and light-labeled cells. After protein digestion and off-gel fractionation, fractions were analyzed by LC-MS/MS, and data analysis was performed by MaxQuant. (B) Scatter plot of the ratio of heavy over light amino acids normalized to the reverse (R) or forward (F) experiment, following a log2 normalization. Hits reaching significance (Benjamini-Hochberg adjusted P value < 0.05) in both experiments are depicted in red. FP, false-positive. (C) Canonical NAD+ biosynthetic pathways. In humans, most NAD+ is synthesized from nicotinamide (NAm) through the salvage (recycling) pathway. NAMPT (NAm phosphoribosyltransferase) catalyzes the rate-limiting step in this pathway. Sirtuins (SIRTs) and poly(ADP-ribose) polymerase (PARPs) enzymes catalyze reactions that consume NAD+. The reaction scheme is based on the Biocyc pathway map for homo sapiens NAD+ biosynthesis (http://biocyc.org/), and adapted from Kim et al (15). NAPRT, nicotinic acid phosphoribosyltransferase; QPRT, quinolinic acid phosphoribosyltransferase; NMNATs, NMN adenylyltransferases; NADS, NAD+ synthetase.